This will be a presentation of popular strategies for the map ‘Plains of Snow’ (POS). I will present strategies for Orcs, on high resources for now. 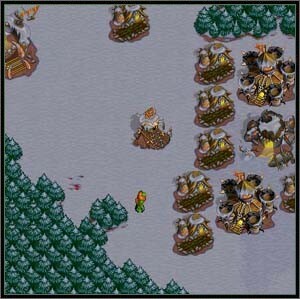 The Battle.net edition map is used, which is very similar to the original POS, except that the 2 o’clock position has more open space in which to build the town hall. The strategies set out are basic structures that you can adapt to your own style. Every game will be different and it takes some practice to get the right timing and adaptability. The determining factors for strategy in POS are the open terrain on a 128 x 128 map, and the small mines (40K gold). This means you cannot mount a full lusted ogre/deathknights attack without expanding first. Grunt rushing from two or three barracks is a sound strategy, and two-halling is certainly feasible. Rushing – Building offensive units early, as opposed to building defensively. Walling in/wall-in – Surrounding your resource gathering operation with buildings, having defences behind the buildings (probably towers or catapults). Expand/Exp – A base at a new gold mine. Repair-build – Repairing an unfinished structure to complete it faster. Main – Your initial main base. Inside-cat – A catapult walled-in at your base for defence. When describing the starting locations on the map, I will use the common method of describing left hand start points as L1, L2 etc (L1 is at top left, L2 is the position below that). Right hand start locations are named R1, R2 etc. Rushing. The aim is to overwhelm the opponents base with a force of upgraded grunts. If you cannot break the enemy defence, or you face an equal force of grunts, then the objective becomes upgrading to a stronghold and expanding. Two Halling. The aim is to build a second town hall very early and defend both mining operations, whilst upgrading to ogres, quickly followed by bloodlust and deathknights. If you get this far and the enemy did not expand early, your superior economy and troop number will mean you can easily overwhelm your opponent. Wall-in. You block yourself in and use a catapult for defence. You can then choose to build a fast ogre/sapper attack, or even make a small force of bloodlusted ogres from one base. By way of explanation, ‘P1 – Hall – Farm – Bar ‘ means ‘the first peon you have makes a town hall, then a farm, then a barracks’. P2 refers to the second peon you make etc. The dots are crudely indicative of building time. Figure one. Example of early base at L1. The tower is optional. Notice the peon ready to wall-in. It is a good idea to start scouting early, because if your enemy is walling in, you will need to rethink your strategy fast. We recommend sending the peon that makes the first barracks to go out and find where the enemy base is as soon as the barracks is finished. That peon can scout one way around the map, and the first grunt you make can scout in the opposite direction. As soon as the smith finishes, start upgrading shields then weapons. Continuously build farms until you have about 29 supply. At this time you should be making your first attack, and the grunts you lose will free up some supply. All the peons you make should go on gold until you have about 800 wood left, at which point the next 3 peons should go on wood, as well as pulling a couple off gold if you feel the need. The point is to upgrade to shields again soon after getting level 3 grunts, and to build up wood for an expansion, third barracks or stronghold. As you build your base, place the buildings in such a way as to allow you to wall-in at any time. If you end up in a situation where your troops are at the enemy base just as the enemy reaches you, you will have to wall off in a hurry and put up a tower inside your wall-in so you don’t get completely overrun. This is normally a better option than retreating your troops all the way back to your base in order to defend. When engaging the enemy in grunt to grunt battles, always try to have the advantage of greater numbers. If you have a smaller number of warriors, retreat back to a position where you have reinforcements. Don’t attack the enemy in piecemeal fashion, wait until you have enough forces to take the advantage. One way to do this is to upgrade your troops faster and attack just as the upgrade completes. Another way is to defend your base with a walled in tower. March your troops the long way around to the enemy base. Make your attack as soon as the enemy troops are at your base, and take advantage of any weak defence. If your enemy has defended and it will be difficult to break into the base with grunts, send a grunt to each of the other 6 expansion points. Also watch out for attempts to expand to the middle. If you have less then about 15K gold, expand yourself, otherwise upgrade to stronghold and expand soon after. Keep some grunts near the opponent’s base and patrol around to kill any peons that break out and harass any troops being built there. If the enemy has defended with a tower and not many troops, you have the option of putting up some offensive towers to help destroy peripheral buildings at the enemies wall-in. Don’t get lazy by ignoring your mining and troop production. Scout around to see if the enemy is building in an out of the way area. You only need two or three grunts (scouting different areas) and a second of your time to order them to attack-move (press ‘a’) to a new location, you don’t need to be watching their progress. If, on the other hand, the opponent is focusing fully on grunt production, you will need to put up a third barracks as soon as you have spare gold from making grunts. Upgrade to level 5 and expand before getting a stronghold, whilst keeping an eye out for your opponents expansion attempts. The next stage of the battle is about killing expansions and producing ogres. Your stronghold upgrade and first expansion should happen soon after each other. Wall in the first expansion and build a tower there, as well as producing peons to mine the gold there. When your first mine gets down to around 5K, you need to prepare a second expansion to put your initial mining peons into. To wall in the expansions, make buildings that will be of use to you, for example a fourth barracks and Alchemist. This crucial stage of the battle will most likely be won or lost on the success of your first and second expansion, as well as the halting of enemy expansions. It is important to be able to refresh your resource gathering effort, keep producing troops, and scout the empty mines all at the same time.